My first 50 or so Cross Hare comic strips were created very haphazardly. At the time, I wasn’t drawing out the entire strip, but doing sketches on different pieces of scrap paper, scanning my drawings, and then doing much of the work digitally. However, that system of working was a total mess. It took way to much time, and left my strips feeling very disjointed. This lead me to come up with a process that I feel saves me time and leaves me with a better product in the end. 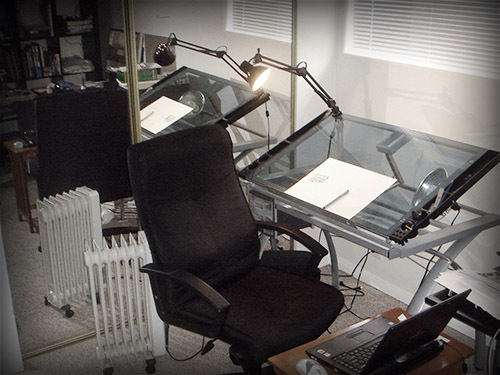 I actually start by writing out my strip and laying out the panels and words in the computer. Sometimes I’ll print this out and use it as guides for drawing my strip. For this particular strip, Cross Hare is just narrating and I don’t have to worry about word balloon placement. This layout does give me a good idea how tall to make the drawings in each panel. I sketch out my pencil lines and do inking on 11×17 board. I use both Bristol Board or Index Paper. I do a general outline for Cross Hare several weeks in advance, and then write each strip the same night that I draw it. Writer’s block can be scary, but I tell myself I have to post a strip every Tues & Thurs with no excuses. There is an on-going storyline for my characters, but I try to have a punchline in each strip. This sometimes adds to the writer’s block. In this strip, I had story that I wanted to tell, but I didn’t feel there was anything funny in the words. Cross Hare is walking across town in the rain to borrow a car from someone. 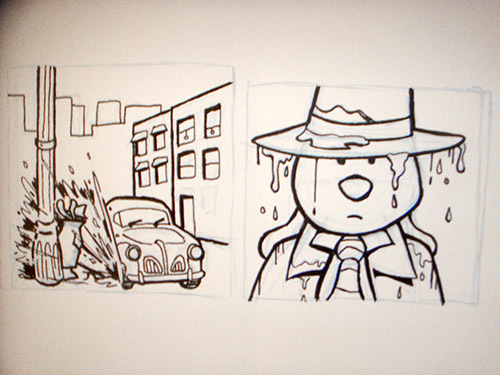 On his way, a car drives through a puddle and soaks our fearless detective. The words don’t really mention the splashing, but hopefully having some funny drawings makes up for not having funny words! Once all my drawings are done, I scan them all into my computer. This is a multi-part process because my scanner isn’t large enough to accommodate the 11×17 sized paper. I stitch the drawings together digitally. I then remove the blue pencil lines and do any touch-up work. 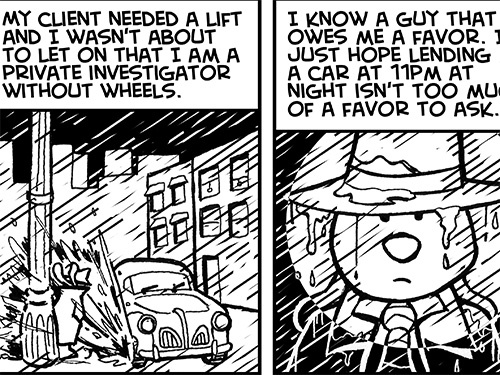 In this strip, I decided to add the rain digitally instead of including them in the original drawings. When I began, I wasn’t exactly sure how I wanted the rain to look. Doing it in the computer allowed me to play around with the rain and not mess up my drawings. Finally, I drop my scan in behind my original text and panels. I came up with some rain that I liked and I also add any large areas of black in the computer. This keeps me from running out of ink in my pens. I’m continually updating and changing my process. 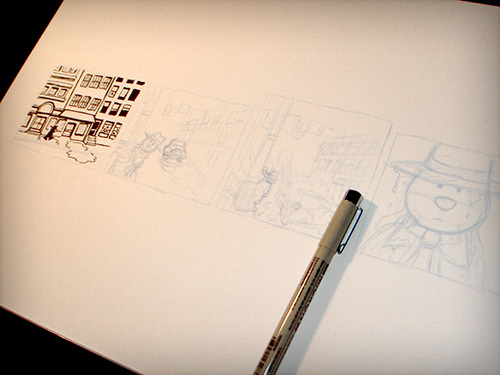 With every strip, I feel there are things I can do better with my drawing and my story. I’ve given myself deadlines and I have to post the strip for the night and hope the next one will be better! Click on the image below to see this strip in all it’s finished glory. I totally agree with TheModernBunny. Hi, I’m Dawn, just came upon your comic from twitter today. Just had to mention this- is that a Gateway Tablet PC? I have the same one, it appears. Love that thing. I do my work 100% digitally now.